Losing my child during delivery, so suddenly and without warning, I felt completely helpless. There were very few things that I had any control over. Everything around me had suddenly turned to chaos. My life became a nightmare in a matter of moments. My hospital room was full of people, and I couldn’t breathe. When my husband managed to get everyone out of the room, I was told I could see Lincoln as soon as I was ready. That was my first little piece of control, and the decision was easy. I wanted him immediately. Upon that very first look, the storm within me was unlike any before. This perfection I created should be crying and hungry. I should be soothing him, and looking into his eyes for the first time. I was told that I could hold him as long as I needed to. It was up to me when I would send Lincoln back with the nurse. I knew from the moment he was placed in my arms, that sending him away would be no easy task. Knowing our time was short, I only let Lincoln leave my arms a couple of times. I allowed a nurse to bathe him, so that my mom could dress him in the outfit I had packed for him to come home in. I watched from a distance as he was cleaned up. I could hardly see him from my hospital bed. I was impatient. Though I couldn’t see, I could hear my mom’s stifled sobs as she dressed him. I love that outfit. It is hanging in a shadow box in my house. After we got home, I spent months holding it close and inhaling the smell. But that day at the hospital, that outfit further broke my heart. It was a tsunami crash of the heaviest grief I had ever known. 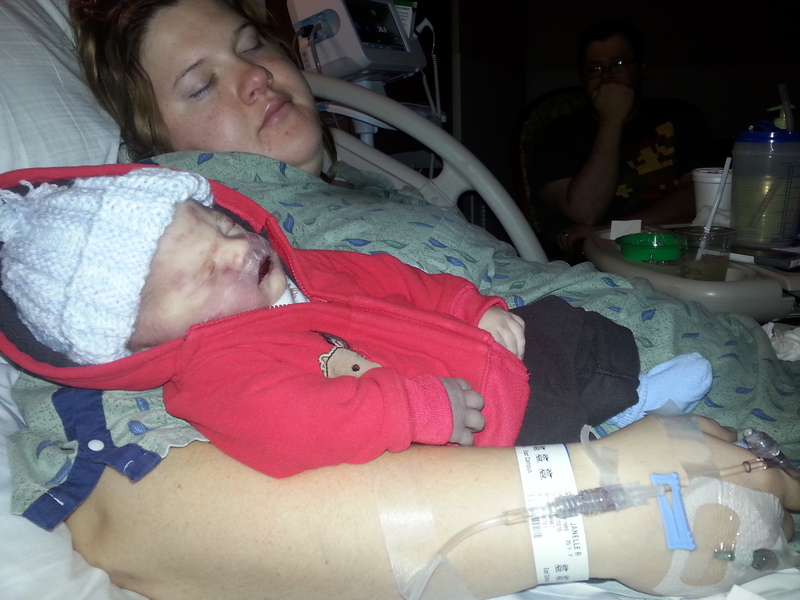 Even moreso than that first moment that my silent son was place in my arms, this moment was the painful reality check. Lincoln is not coming home with me. That outfit brought an onset of brand new tears. The pain was almost unbearable. My tears soaked the fabric of the tiny red sweater. When I was able to calm myself, I was able to see just how precious Lincoln was in that outfit. He was so tiny. 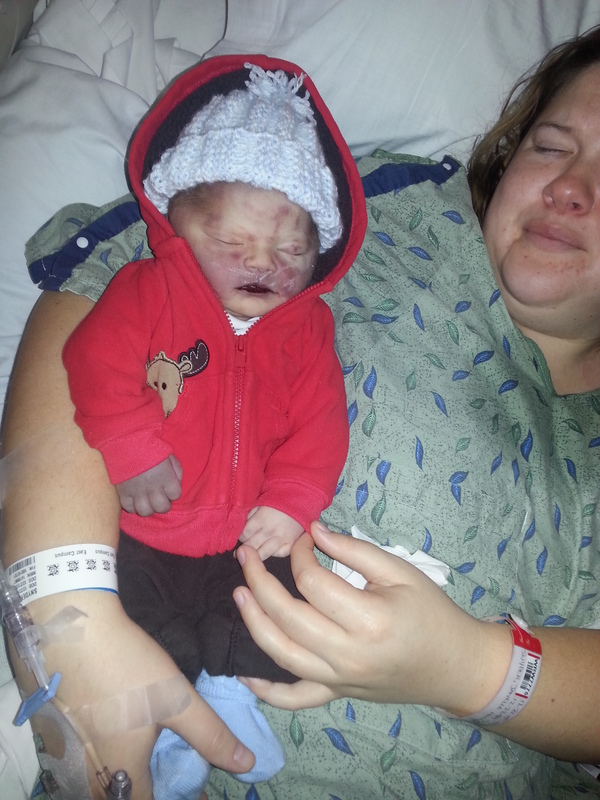 The newborn outfit and socks were too big for him. The pant legs were cuffed, and the socks were baggy. I love these little details; these things that make his beauty so distinct, and my memories so vivid. Those 11 hours felt like much less. I was exhausted beyond belief. My labor was roughly 36 hours. I lost a lot of blood. I was in shock. And I was on a lot of different drugs. The first pain medication I was given, caused severe nausea. I had to pass my sweet baby off to whoever was closest so that I could throw up. Although there was nothing in my stomach, this happened three times. My body was the weakest it has ever been. A couple of times, I slept. I tried to keep my eyes open. I tried to keep them fixed on my precious son. My mom and husband sat next to me, making sure he stayed snuggly in my sleepy embrace. I have never fought harder to stay awake. But sleep won a few times, shortening my already limited time with my beautiful boy. The moments I spent awake, I spent very little time thinking of how I would say goodbye. I held him close. I soaked in every moment. I cried vigorously. I kissed his perfect face. I touched his tiny feet and held his tiny hands. I studied his every detail. But then, as time passed, I recall being asked a couple of times, “Is it time?” Once it was my husband, who reminded me that we would have to make the choice. I sobbed and continued to say no. And then, out of nowhere, after those 11 hours, I just knew. It was time. Suddenly I was ready, and I didn’t know how that could possibly be. My husband asked me. My mom asked me. The nurse asked me. Are you sure? I was. There was a natural process and I’m so grateful for it. Lincoln had changed. He was colder, stiffer, and very suddenly less alive. Like the last bits of his soul had finally gone. Through heavy tears, I gave my final kisses and sent him off. Though I hated the moments without Lincoln in my arms, I wish that everyone I love could have had a chance to hold that beautiful baby boy. Since that didn’t get to happen, I will make sure you all know him this way. I will keep telling his story. I will keep his little outfit on display in my house. I will carry him with me in my heart. Always. **This was a bittersweet day. 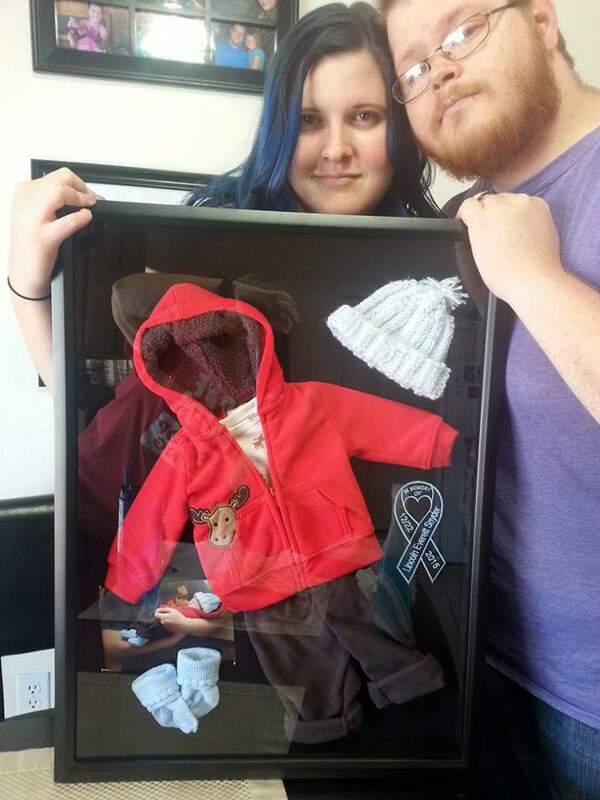 4 months after losing Lincoln, we finally assembled this box to display. The little pants remain cuffed, just as Lincoln wore them. I am so grateful for the nurse who so carefully returned his outfit to us.